Maybelline Volum'Express Pumped Up! 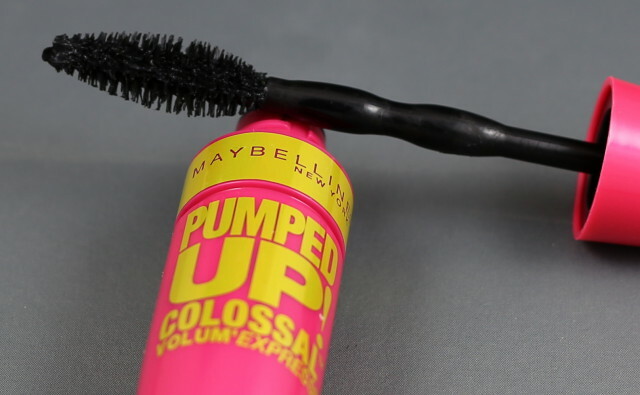 Colossal Mascara - $8.99 - Maybelline's most volumizing mascara yet thanks to the applicator and its breakthrough extreme volume system. The wand has a unique double-curved stem which allows for an extra shot of volume to be applied quickly in one swipe. The patented brush features extra-large bristles in a unique helix shape to load each lash with extreme volume, while lifting them up and fanning them out. The formula contains fine waxes, thickening agents and emollients that allow the mascara to brush easily onto lashes for extreme, buildable volume. The pro-keratin formula plumps and strengthens, while smoothing lashes for a clump free finish while glossy, flexible film-formers enhance the wear properties for a lasting result. I'm not usually a fan of volumizing mascara, they are usually too much work to keep them from looking clumpy - but this one I just brushed through my lashes a couple of times and they came out like this with absolutely no effort - next time I would use with an eyelash curler as I didn't get the lift they promised but otherwise, I'm very impressed! For me I prefer even more volume but love this for an every day wear - or with lots of layering!